"We are empowering people to experience the digital world in a whole new way, blurring the line between real and virtual, and allowing people to be anywhere and do anything," said Manuel Gutierrez Novelo, CEO of ImmersiON-VRelia. For a VIP demo during CES 2015, please visit LVCC South Hall 25211. Headlining the show, is “The GO,” ImmersiON-VRelia’s universal, smartphone powered Head Mounted Display. The GO transforms most iOS and Android smartphones into a powerful Head Mounted Display that enables a fully immersive virtual reality experience. This unique device features adjustable focus for each eye, so no glasses are needed, as well as eye-separation control. The versatility of the GO enables immediate compatibility with hundreds of millions of smartphone users. The GO is available as a bundle with the Gamepad-F2 special edition from Viaplay. This fully featured smart gamepad is optimized for the Immersion-VRelia experience so users can enjoy and navigate The AlterSpace without having to physically touch the phone screen. ImmersiON-VRelia will also be demonstrating the BlueSky Pro to a select group of partners: BlueSky Pro is the Ruggedized, Wide Field of View, Head Mounted Display designed for unparalleled Out of Home Entertainment. BlueSky Pro comes with dual Full HD displays, and optics superior to any other offering in the market. “We are empowering people to experience the digital world in a whole new way, blurring the line between real and virtual, and allowing people to be anywhere and do anything,” said Manuel Gutierrez Novelo, CEO of ImmersiON-VRelia. ImmersiON-VRelia will be showcasing many different types of stereoscopic 360 Immersive experiences through its AlterSpace platform, which serves as a Virtual Environment, Content Marketplace, and VR multimedia center. Topping this content are productions from JauntVR, Specular Theory, 360 Heros, and premiere partner, ThinkUp. 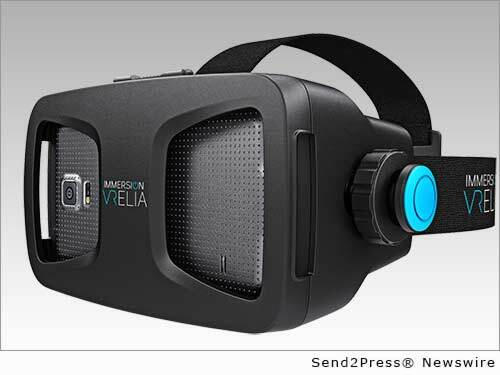 ImmersiON-VRelia is focused exclusively on the creation of wide field-of-view 3D Stereoscopic Head Mounted Displays and Heads Up Displays for virtual reality and Augmented Reality for multiple industries. For more information about ImmersiON-VRelia, visit http://www.immersionvrelia.com/. *PHOTO for media: send2press.com/wire/images/15-0106-Immersion-GO-300dpi.jpg . Original Keywords: Virtual Reality hardware and software platforms ImmersiON-VRelia Las Vegas Nevada LAS VEGAS, Nev.
REFERENCES: Electronics News, Virtual Reality hardware and software platforms ImmersiON-VRelia Las Vegas Nevada LAS VEGAS, Nev.